In the book 'Beekeeping for All' (here translated from French by David Heaf), Emile Warre described his 'People's Hive' - now commonly referred to as the Warre hive - and some accompanying 'natural' beekeeping practices. We can apply his basic practices of management to any type of hive, but often with some limitations due to the hive's design. 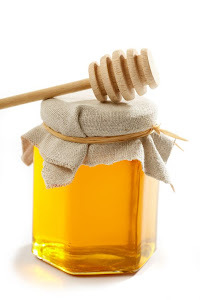 Take, for example, the Langstroth hive, which is by far the most common type (probably 99.9%!) in use in Australia. 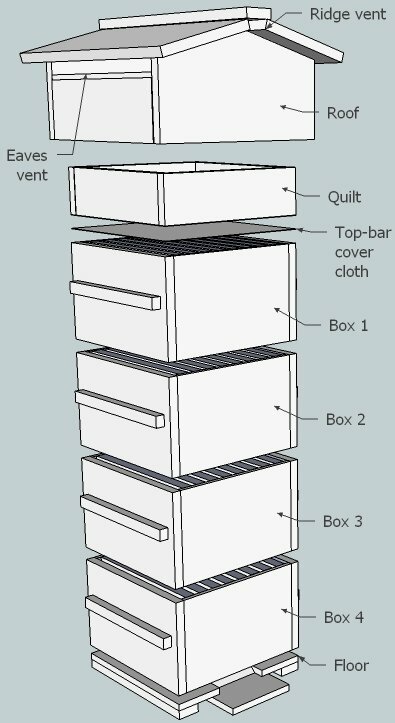 Warre favours top bars (TBs) with no frames, boxes of certain dimensions which are square in plan with no upper hive ventilation. The Langstroth does not align with any of these. On top of that, legislation in Australia requires the use of removable frames, regardless of hive type. So, if we've invested in Langstroth hardware and wish to move some way towards the Warre hive design approach, what can we do? Selling everything and starting again isn't usually a good option. Modifying the Langstroth hardware seems a logical stepping stone. Assuming we can't cut down our (occupied!) 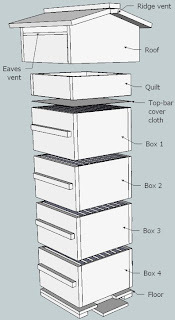 Lanstroth boxes from rectangular to a square shape and also that we need to keep our frames, then there is one physical aspect we CAN address quite easily - ventilation. This relates to the Natural Beekeeping concept of 'retaining nest scent and heat'. Heat is central to Warre's beekeeping and this is extended in Johan Thur's book Beekeeping: natural, simple and successful to include 'Nestduftwärmebindung' - retaining nest heat and scent. We can achieve this by management practice, that is, not opening up the hive except when it's absolutely essential. We can also achieve it physically by modification of the Langstroth roof. The typical Lang roof has four holes around 15mm diameter, under the roof is a mat which has at least a bee space around the sides. 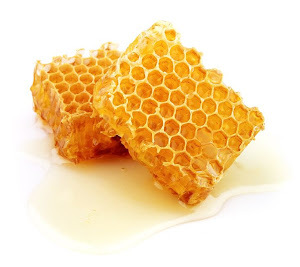 This arrangement allow positive ventilation of air through the hive via convection. As the bees warm the air inside, it rises to the roof and vents easily, to be replaced by cool air drawn in through the bottom entrance. If you have any doubt about that, try sniffing at the holes and notice the hive's aroma escaping. 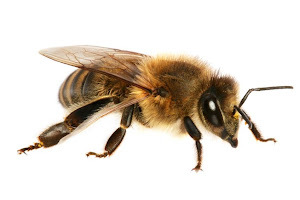 Arguably one might consider this a good thing, fresh air coming in for bees to breath easily, removal of unwanted gases and humidity from ripening nectar. It might also help the bees stay cooler in the hot Australian summer. Then again, what's good for summer temperatures might be the opposite when winter comes and the bees need to conserve energy. prevents rodents entering the quilt material - using the cover board. I built one for my own Lang by adapting Warre's plans for use with Langstroth dimensions. The total cost was $20 in materials and probably a day to build (measure twice, cut once!). it looks more like a 'real' hive - quite fetching! So many people have told me Langs look too much like filing cabinets! less problems with rain water building up on the landing board. the top bar cloth is convenient because it completely convers the box, so you can quietly remove the roof and listen to the hive and maybe peel back a corner a few cm to see how the top box is filling. All this without exposing the bees. above 24-26 degrees C, a few (1-6) bees appear on the landing board and start fanning to vent hive air. This never happened at these temperatures with the Lang roof. at 30+ degrees more bees start fanning. in the recent heatwave the bees started bearding at the entrance at 6-7pm on the 36 degree day. We had at 41 degree day due the next day, so I reverted to the old Lang roof but retained the Warre top bar cloth, as an experiment. During that evening there was still bearding taking place - but with less bees outside the hive. If you'd like one for your Lang, I'd be happy to build some more - $$ negotiable!